Quirky Jessi: Art shows how minimum wage is earned - Penny for your time? Art shows how minimum wage is earned - Penny for your time? "The minimum wage machine allows anybody to work for minimum wage. Turning the crank will yield one penny every 5.04 seconds, for $7.15 an hour (NY state minimum wage). If the participant stops turning the crank, they stop receiving money. 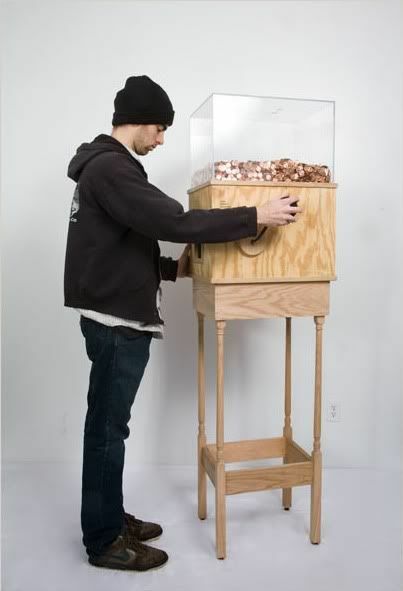 The machine's mechanism and electronics are powered by the hand crank, and pennies are stored in a plexiglas box." Talk about having to earn your keep, huh? I first saw it on Blake Fall-Conroy's site, but have since then seen working example pictures of it.